Vertigo and disorientation are some of the first feelings Thaiburley, the city of the title, is likely to induce. Also known as the City of a Hundred Rows, these Rows are whole districts piled on top of each other, in a city carved into a vast cliff face and patrolled by an airborne Kite Guard. Tom is feeling both of these things acutely when we first meet him. He's a young slum boy or street-nick who runs with the Blue Claw gang, and he's busy scaling the Upper Heights. He's out of place, and looking to steal a token of his escapade so he can prove to the other members of his gang that he's actually been to the top. But he gets more notoriety than he bargained for when he witnesses a crime which he is subsequently accused of. Tom goes on the run, hoping to hide out in the City Below. Yet unfortunately for him nothing is as it first appears: strange moods are affecting the street-nick gangs, peculiar machines are stirring, and something or someone is out to get him. His attempts to avoid trouble don't always work out, and his uncanny ability to hide may not be enough to save him. Tylus is the Kite Guard assigned to find Tom and bring him to justice. Within his department he's considered to be an incompetent and routinely gets ridiculed. In the busy, underfunded guard station in the City Below he has to fight for the resources he needs to get the job done, and he soon discovers that his official warrant doesn't count for much down there. Meanwhile an assassin with a mean streak and a high opinion of himself is shadowing Tylus, and he doesn't have the Kite Guard's best interests at heart. Thaiburley is an exotic place full of dark, alien beings, demons, hybrid machine-creatures, magic users, and odd flora and fauna. It's not somewhere you could easily mistake for anyone else's fantasy world. Ian Whates has adopted an ultra-alien style of worldbuilding for this novel, so that every corner turned is a journey into new landscapes and experiences. From the artistic, psychic Jeradine creatures to the deadly, inhuman Blade and the carrion-eating spill dragons, this book is full of unusual creations that demand further investigation. All of this strangeness would be overwhelming if it weren't grounded in some normality, and luckily it is. There's a certain familiarity to the city, which has electricity even though parts of it seem steeped in a much earlier stage of development. The main characters' believable reactions to events lend even more realism to the story, and the differences between the way they see themselves and how they view each other makes for an interesting commentary on the human capacity for self-deception. 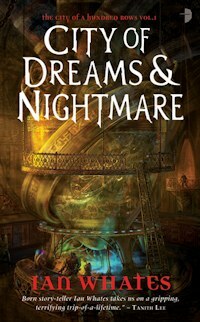 City of Dreams and Nightmare is a cunningly layered mystery with all the elements a gripping adventure needs. There's politics, action, magic, romance, and creatures Lovecraft would have in his zoo. But it gets better, because amidst all the fast-paced mayhem and weirdness we get to meet some likeable, believable, nuanced characters who drag you into the action and keep you there until you're caught up in their very, very strange world. The Warden has fallen from war hero to criminal, but he will not stand for the murder of a child on his patch. A young man without family gets entangled in a plot that threatens his city in this far-future thriller. 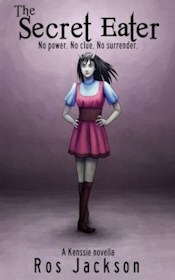 An ice age is about to grip the land, but it's high season for murder in this fantasy adventure. Which is the furthest south of Australia and Norway?